Hey y'all! Remember me? Turns out my new school in a new language in a new continent takes a lot of time and energy! Daughter of Smoke and Bone was one of my favorite books that I read last year, so I bought the sequel the day it was released. Yet, somehow, it took me two months to read it, and I don't think that can be blamed on my busy schedule. Where Laini Taylor's first novel in the series was all about love, discovery, and the creation of a beautiful world; Days of Blood and Starlight is full of death, war, and the destruction of many worlds. That will never hold my interest, no matter how gorgeous Taylor's writing is. Her sentences are still as wonderfully descriptive, but what they describe does not appeal to me. The second novel in a trilogy is always challenging...the story needs to be moved ahead, but there can be no real resolution, and a beloved character or two usually gets the chop. 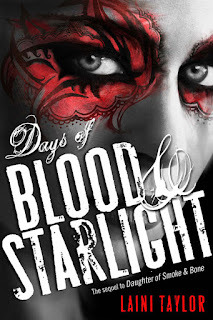 The only reason I kept reading Days of Blood and Starlight is because I am convinced that Taylor will give readers the satisfying conclusion that they deserve.